Wendy Humphreys Tebbutt, Co-creator of the Sunshine Coast Trauma Recovery Centre for Survivors of the Residential School System. The late, GREAT Peter Gzowski, journalist and host of CBC’s Morningside radio programme, much beloved by Canadians across our country and who took great interest in and had the utmost respect for the people of Northern Canada. PG: Wendy, years ago, I knew you as a soprano soloist based in Toronto, singing opera, oratorio, operetta, chamber music and solo recitals across Canada and on CBC Radio. I know you performed a lot of Canadian music, both as a soloist and as a member of 3 different chamber groups: Music From Sharon, Four West, and Laughton & Humphreys. You also sang the title role of Princess of the Stars in both the Prologue (Princess of the Stars) and the Epilogue (And Wolf Shall Inherit the Moon) to R. Murray Schafer’s huge theatre cycle, entitled PATRIA. So, how did you go from being a classical singer, who had also been an orchestral harpist with the Vancouver and Edmonton Symphony and Opera Orchestras, to being the co-creator of the Trauma Recovery Centre for Survivors of the Residential School System, here on the Sunshine Coast of BC? WHT: Well, back in 1991, I had a duo with Stuart Laughton, one of the founders of The Canadian Brass. We had a lot of music written for us by Canadian composers, much of which can be found on our CD “Opening Day” on the Opening Day label. In our concerts, Stuart played trumpet, piccolo trumpet, the flugelhorn, the valveless (Baroque) trumpet, and the cornetto (ram’s horn) and I sang and also played Celtic harp. Peter Tiefenbach played piano and organ for our concerts, as well as writing absolutely glorious music for our duo. In 1991, Stuart and I received Canada Council grants to go to London, England to study Baroque performance practices with top trumpet and singing teachers, as well as coaching with harpsichordist/conductors. The teacher I worked with was Dame Emma Kirkby’s teacher, Jessica Cash. At the end of my first lesson, Jessica asked me why I wasn’t having a huge, international operatic career. I explained to her that opera really did not feed my soul any longer and I had stopped singing it the previous year. Jessica’s response was, “I don’t care. Something’s wrong. Your name should be a household word in the opera world! Can I muscle test you?” Well, I let Jessica muscle test me and I was blown away when I realized there was a way for us to communicate with my whole brain-body system! WOW!! We discovered that my self-esteem was in the sub-sub-sub-basement and who helped me put it there! That moment changed my life! And it changed how I sang, as well as how I would teach in future. I asked Jessica what this muscle testing was all about and she said it was a form of Specialized Kinesiology (SK). She had just taken a short week-end class which taught her a few techniques from various systems of SK, yet she was able to put this information to great use in her lessons. When Stuart and I returned to Canada, we were doing a lot of performing and recording, but on January 18th, 1992, I took my first workshop in Specialized Kinesiology. And the following week-end, I took the 3 day, Level 2 class. The very next day, I began an 8 day contract with the National Ballet of Canada, singing as soprano soloist in Del Tredici’s “Alice” – a ballet about the writing of “Alice in Wonderland.” Now, normally, I’d had gout-like pain in the ball joints of my feet almost every day for 20 years – and the day after a performance, I could barely walk for the pain. Well, after I’d sung my performances with the National Ballet, I came home the next day and was trotting about the house with no difficulty. My husband asked me, “Aren’t you in pain? You’re always in pain after a performance.” Well, I wasn’t in pain! Not at all. And all I had done differently, was to do all the SK activities before each performance and the sessions that I’d done within the SK classes. I had no further pain in my ball joints until a trauma occurred in 2012…21 years later! So, I was hooked! While I was still singing professionally, I completed my training in the SK modality called Three-in-One Concepts. I had a practice in Bloor West Village and my clients were mainly my musician colleagues, my singing and harp students, and performers referred to me by other professionals. Performers who had major performance anxiety could suddenly feel comfortable and “in the zone” when playing solo gigs with major orchestras…or a couple of singers who felt they hadn’t the stamina to make it through a vocal competition, actually won their competitions…or another singer who had had pain in her neck and shoulders for almost a year due to a very bad car accident was finally able to release the pain and tension, when nothing else had helped her all year. PG: So, when did you stop singing? WHT: The following year, 1993, I sang the role of Princess of the Stars within “And Wolf Shall Inherit the Moon” (aka “The Wolf Project” to the performers in this 8 day ritual theatre project) for the first time. While everyone else from my campsite was away practising for the mid-week Forest Encounters (each amplifying a character within the main production), I stayed in camp to practise my arias. I recall standing on what I called “Fire Rock” looking down the lake, which was surrounded by ridges in the forest, and singing “O Sun Father…Light of the World…I come to you, I sing to you. My spirit soars. I am one with you.” Murray’s music is written to catch the echoes from the ridges, across the water and from the forest. As I sang to the lake, the forest and the sky that day, I heard my inner voice say, “I could care less if I ever sing in a concert hall again. Just let me sing Murray’s music in the wilderness!” All I can say is, be careful what you wish for! Within 2 months, I began having flashbacks to a trauma which had nothing to do with performing – yet, with the exception of singing Murray’s music written for the Canadian Wilderness, I needed to come off stage in order to heal. And 2 weeks after the first flashback, I was rear-ended on the highway, and the resultant pains and emotions were all tied to the flashbacks. I used only the tools of SK to get me through the trauma. As one person said, you’ve come through this in 9 months, whereas with traditional therapy it would likely have taken about 10 years! So, that year I just looked after myself, and my friends on the Wolf Project (who were my family of choice) helped me through this difficult year. I sang the role of Princess of the Stars for 10 Summers, including the professional performance of the the Prologue, Princess of the Stars in 1997. Stuart Laughton was also part of the Wolf Project and we recorded quite a bit of Murray’s music over the years. PG: So, when did you move out West, Wendy? WHT: I’d grown up in the West and had met my husband, Alec Tebbutt, when we were singing together 7 days a week in Edmonton, touring opera for Edmonton Opera and as founding members of a professional chamber choir called “Pro Coro Canada” and an octet from within it called “ConSept” meaning our conductor, Michel Gervais, plus seven singers from Pro Coro. 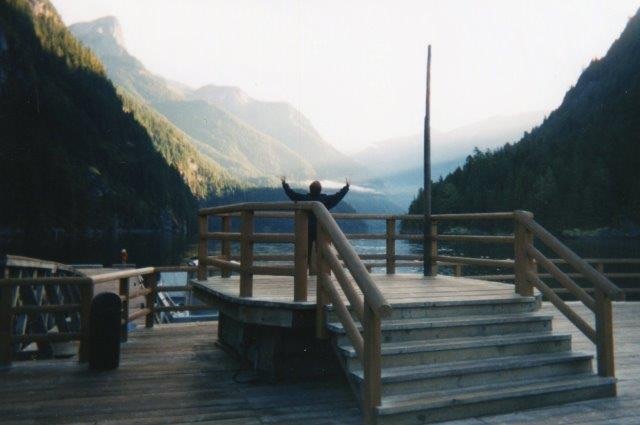 When we moved to Toronto, Alec sang at Shaw Festival for 2 seasons, then began singing as a professional chorister with Taffelmusik and The Elora Festival Singers, as well as part of a 6 man a cappela group called “The Gents.” We moved to the Sunshine Coast in 2000. There’s quite a large Specialized Kinesiology community in BC, particularly in the Lower Mainland. Dr. Charles Krebs, a former quadriplegic, and Jacque Mooney began teaching Charles’ LEAP-Brain Integration programme (LEAP= Learning Enhancement Acupressure Programme) in Vancouver. They also returned each year to teach us SIPS Kinesiology (SIPS= Stress Indicator Point System) and Applied Physiology. These are very powerful, advanced forms of SK, which require one to have another SK modality under one’s belt before beginning these trainings. In 2015, after about 3 years of major research, Charles was given a grant of $100 Million to create an institute in Boston, with Dr. William Tiller, to research why his LEAP Brain Integration system and other forms of SK actually work. PG: Are you a practitioner of these SK modalities or are you an instructor as well? WHT: I’m an instructor of some of the entry level modalities, such as Touch for Health, Brain Gym 101 & 201, Rhythmic Movement Training Int’l (which is a movement based system which helps to integrate childhood reflexes for children, trauma survivors, and seniors). I also teach the first 2 levels of SIPS Kinesiology. PG: How does Specialized Kinesiology fit in with music? WHT: Well, you know, even when I was singing, my intention was to take my audience away from their everyday lives and transport them into the world of poetry and music. Music had always been a form of succour for me. My early life had a lot of traumas, and playing the harp and singing really helped me stay relatively calm and focused. So, I think that was a form of healing that I was offering the public, although I didn’t think of it in that way at the time. The SK fit into my music very well. While in Toronto, I always included SK techniques when I taught singing or harp lessons. I also created a short workshop to introduce SK to performers. My singing students became professional performers and teachers in their own right…singing at the Shaw and Stratford Festivals; in the major musical theatre shows in Toronto, the USA and Germany; and one winning the prestigious national Eckhardt-Grammate Competition. I was invited to teach 6 units of the University of Toronto’s new course “Advanced Studies in Performance” for the graduate students in the Music Performance programme, which I did for the 2 years prior to moving back to the West. Many of the students said they wished I could teach them for the whole year! PG: And how about adding music to SK? WHT: Well, in 2005, I submitted a proposal to be a presenter at the International Brain Gym Gathering in Ventura, California. The theme that year was Community, Creativity & Communication. My proposal was accepted and I created and taught my first “Switched-on Singing: The Power of Voice” workshop to a full house and we all had a fabulous time! I had invitations to teach the workshop in South Africa and Brazil. I’ve taught that to various choirs and choruses since then. Yet, it wasn’t until I was invited, by a young mother, to come up to the Yukon and Northern BC to teach some one-day classes and do 23 private sessions and a consult for an elementary school, all within 12 days, that I realized exactly how I would be putting all my tools and talents together. PG: It took you that long to find your place in SK? WHT: Yes, it did. I had never really felt that I fit the usual mold of a Specialized Kinesiology practitioner, as I worked with both the Advanced forms of muscle monitoring based SK as well as 3 movement based programmes. Most practitioners choose either the muscle monitoring modalities or the movement based modalities – rarely both. I can think of 3 other practitioners / instructors in Canada who use / teach both forms of SK. One of the movement based modalities, Rhythmic Movement Training Int’l., introduced me to integrating the primitive and postural (childhood) reflexes. When I read about the Fear/Paralysis Reflex (FPR) and the Moro Reflex, I recognized that these two reflexes had controlled my whole life and explained why I’d always said that “I’ve been in all the right places at all the wrong times.” It became my passion to get the word out about the dramatically negative effects of aberrant reflexes to educators, therapists (OT’s, PT’s, music and art therapists), behavioural optometrists, psychologists, performers and parents. Many other labels could disappear if these childhood reflexes could be given the opportunity to fully develop and become inhibited, as they’re meant to do. FPR is almost always present in Autism, and we look at ADD/ADHD not as a diagnosis, but as a brain that is not yet fully linked up. Things change, as we make these little baby movements. Suddenly, “calm is an option!” In 2016, I wrote a book and created a workshop on integrating childhood reflexes for professional and student musicians, both instrumentalists and singers. And, I’ve taught the workshop at various conservatories, private music schools and universities as I travelled the country to teach the certificated classes. When I got to work with some wonderful First Nations women in Northern Canada, I found our connection to be incredibly tender and completely trusting of each other. Almost everyone asked if I’d be willing to come up to do sessions again, and one person asked if they could bring their whole family down to the Sunshine Coast to work with me. A few women also said they wished they could strengthen their voices. And that’s when everything clicked into place for me. I could put some singing classes up on the internet, so women who were dealing with PTSD could access these classes and gently, on their own, be able to begin strengthening their voices by learnig to sing. I remember that when I was dealing with my PTSD I did not want to hear my voice – not my speaking and not my singing voice -until I had gotten through the worst of the flashbacks. And, it was singing R. Murray Schafer’s music in the wilderness that was the most healing environment for me. PG: So, how did the Centre come about? WHT: Knowing that a family was considering coming to the Sunshine Coast to work with me, I approached the people of the Shishalh (Sechelt) First Nation to ask if they could provide any kind of support or welcome for these people who were coming down to the Sunshine Coast to help heal from the effects of the Residential School system. When I was asked about my classes and private sessions, I explained that one elder in a community in the Interior of BC had said to me, after attending my 3-day Brain Gym class, “Wendy, my time in the Residential School system was extremely traumatic. I still have nightmares about the schools. I never thought I’d have tools to overcome the effects of those traumas, but today you’ve given me those tools. Thank you.” Now that made my heart sing! We continued to have conversations about SK and how it can help release stress, then I offered demonstrations of the various types of techniques I use in private and group sessions. After the first family came down to work with me, members of the Shishalh Nation and I co-created this centre for healing. Visitors receive private sessions with me, and also with practitioners of other modalities, as well as from within the Shishalh Nation. My husband and I, plus friends from the SC Search & Rescue team and the Shishalh Nation would also take our visitors to sacred places on the SC. It was on these outings, that I would sing the shorter arias by R. Murray Schafer, which celebrate the various aspects of the Canadian Wilderness, as well as representing the 5 Elements of the Chinese Medical Model (upon which SK is partially built)…O Sun Father (Fire Element), O Earth Mother (Earth Element), O Mountains (Metal Element), O Moon Lover (tides – Water Element), and O Forests (Wood Element). Our visitors, having had some group singing lessons, in addition to their private and group sessions, would join in singing with Alec and I to catch the echoes that are so inspiring in the wilderness. So my trip North that Fall of 2015 was truly a gift for me. I still fly up North 2 or 3 times a year to work with my private clients and to teach SK classes. I fly across Canada a couple of times a year, too – to Calgary, Guelph, Toronto and Halifax. But mostly, I now get to stay home on the Sunshine Coast, where I live in the forest and across the street from the ocean (Welcome Passage) in Halfmoon Bay, BC. I still play the Celtic harp and for my musical soul, I teach Celtic harp, and also singing, to wonderful retirees who make music for the love of music making. My new “family” includes the members of the SC Spinners & Weavers Guild, who have kindly kept me in their fold even though I have limited time for practising the art of spinning, weaving and knitting. I always said that when I retired I would live by a lake and become a spinner and a weaver. Well, I won’t be retiring – not with this beautiful work that is my life’s work. Here on the SC, I live in paradise and use all of my tools and talents in service to others, alongside my husband who is my friend and the love of my life. From the SCS&W Guild members, I read of a Gandhi quote, “The music of the spinning wheel will be as balm to your soul.” Gandhi saw spinning as a way to bring industry to his people and raise them out of poverty. He felt that everyone should spend one hour a day spinning, as a form of waking meditation. That quote had always inspired me, and we were able to bring the SCS&W Guild members, the spinners and weavers of the Shishalh Nation, and our visitors together to join in spinning and healing together. I still feel so blessed to be part of this community. Wow! You have been busy…caring about others I wish for you all your dreams come true!